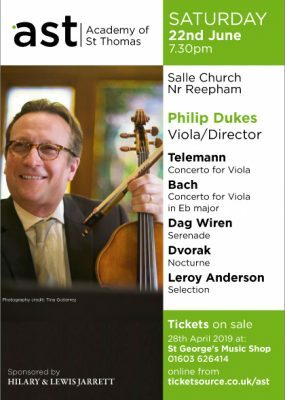 Well known to AST audiences, Philip Dukes returns to perform two lovely baroque viola concertos. He will conduct the rest of a programme ideally suited to the ambience and acoustics of this wonderful Norfolk Church. Do bring a picnic to enjoy by the cricket green.